Lucy from Lucy's Book is pretty much me as a kid. I loved going to the library with my family to select the next lot of books to devour. I pretty much spent all my spare time as a kid and a teen (and alright, now as an adult) with my head stuck firmly in a book, and I actually recall my father telling me that I 'read too much' (obviously he is a ridiculous man, as there really is no such thing!). Right from the stunningly beautiful book-lined library shelves on the front cover, through to the gorgeous books raining down on the end papers, and all the divinely detailed and busy illustrations in between, Lucy's Book has set my librarian heart aflutter, sent a tingle up my book nerd spine, and immediately transported me 20 years back, deep into childhood nostalgia territory. 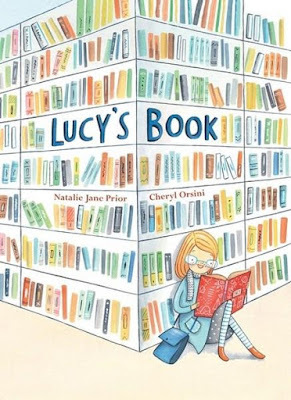 When Lucy borrows a brand new book from the library, she loves it so much that she reads it everywhere she goes, and she reads it through twice before returning it to the library. Lucy's friends are so excited to read the book after her, that it pretty much never hits the shelves again. It is borrowed straight from the returns trolley and then is passed, loaned, borrowed, shared and returned from friend to friend until finally, it is removed from the collection because it is so worn out. 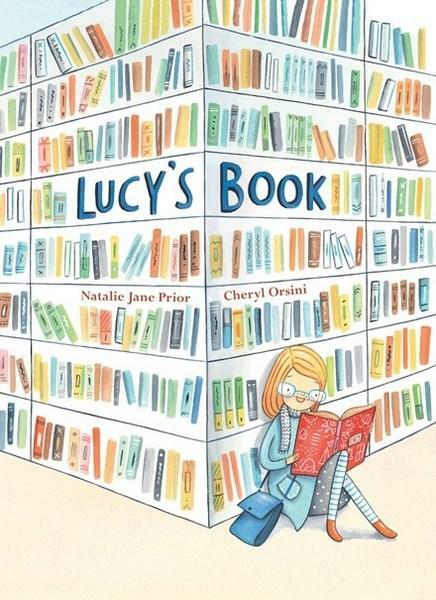 Lucy's Mum tries to buy a copy from the bookstore but it is not available anymore, Dad even tries to buy a copy online but without success. Lucy is heartbroken. 'But what will she do without her favourite book?' I can hear you gasp. Well you can dry your tears because Lucy's Book does have a happy ending (I'm just going to leave it for you to discover for yourself what it is!). What I particularly loved about this story, besides the wonderful use of library jargon, was the different reactions of each character to reading the same book, highlighting how we all respond in different ways to the same stories, the same illustrations, the same books - they can mean completely different things to each reader. And as Natalie Jane Prior so wonderfully writes, 'The book belonged to everyone who had ever read it'.